Daniel Ricciardo and Max Verstappen believe they are a step closer to the leading teams in Monaco after a promising free practice on Thursday. Verstappen finished the first session in third place, while Ricciardo went a step further in the second session, with only championship leader Sebastian Vettel ahead of him at the close of the day. "We put some good laps together and know where we need to improve so I’m very happy with our position after the first day," said the Australian after completing 80 laps on Thursday. "We have good downforce here, the rear of the car feels like it is working the best it has so far this year. "If we can get the tires warmed up I think we can be pretty close on Saturday. I’m pleased with the cars rhythm and set-up which gives me confidence and makes me feel we are back in that groove after the first couple of practice sessions. 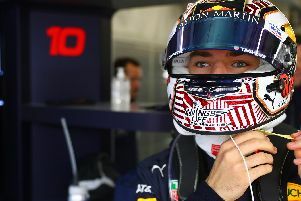 Verstappen added: "“It felt quite straightforward today, the balance of the car felt ok and we didn’t do too many big changes so we are pleased with our performance. We still need some small improvements which we will hopefully find overnight and be up there at the front on Saturday. "The red flag in the second practice messed up my run a bit so I didn’t get a good chance on the new tyres and to show a true fast lap potential. "I have learnt from the last few years you do not need to be the quickest on Thursday, it takes a lot of concentration here as one small mistake means you are in the wall and the session is over.